Image caption Mario Draghi, President of the European Central Bank in 2014 in Frankfurt, Germany. 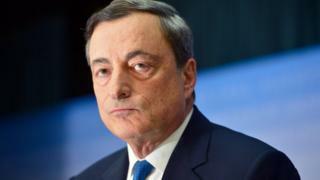 European Central Bank President Mario Draghi has warned against protectionism, saying it poses a "serious risk" to the global economy. He said free trade is critical to future growth, especially in advanced economies with slowing population growth. "We need to resist protectionist urges," he said. His remarks come as concerns over globalisation have fuelled populist movements in the US and Europe. The UK voted to leave the European Union last year, while the Trump administration has increased trade rhetoric against countries such as China, Canada and Mexico. Speaking at a gathering of central bankers and economists in Jackson Hole, Wyoming, Mr Draghi said "openness to trade is under threat". He noted that temporary trade barriers cover more than 2.5% of products today, up from 1% in 2000. Mr Draghi said international efforts are the best way to address rising concerns about fairness, equality and security that have surfaced amid the relatively slow economic growth in the US and Europe since the financial crisis. He urged action through organisations such as the World Trade Organisation to address variations in tax regimes, take a stand on labour regulations and put together rules for cross-border finance. "At a time when disaffection with openness is growing, multilateral institutions become more, not less important," he said. "They provide the best platform to address concerns about openness without sacrificing open markets. Mr Draghi spoke after a speech by Federal Reserve Chair Janet Yellen, who focused on financial stability.